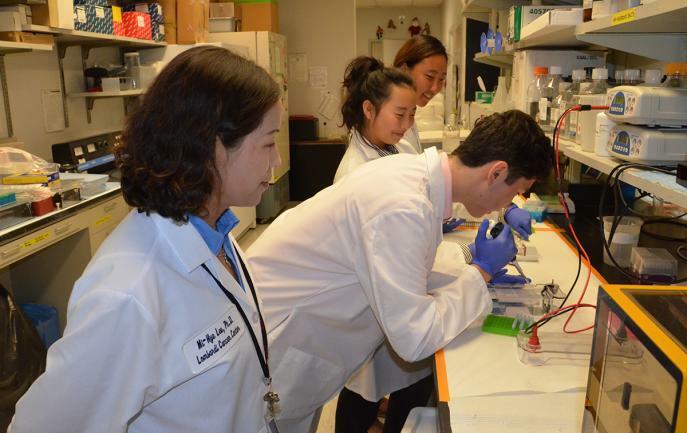 Students in the Summer Research Volunteer Program at Georgetown Lombardi Comprehensive Cancer Center performing an experiment in the lab of Stephen Byers, PhD, with Mi-Hye Lee, PhD, standing by to provide guidance and support. (August 23, 2018) — Whether helping to prepare data that could be used by NASA or assisting researchers designing a major clinical trial on lung cancer, high school and college students volunteering this summer at Georgetown Lombardi Comprehensive Cancer Center gained valuable insights about scientific discovery and cancer biology from top researchers in the field. Founded five years ago by Mira Jung, PhD, professor of radiation medicine, the Summer Research Volunteer Program helps fulfill Georgetown Lombardi’s mission of educating and training the next generation of scientists to solve the toughest problems in human biology and disease. The program is extremely competitive. Only 10 percent of students are accepted out of hundreds who apply. Students are connected with investigators who share their research interests. 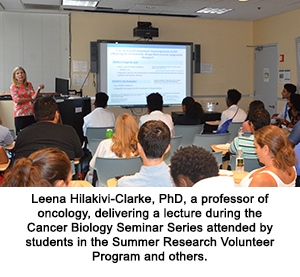 During the summer, the students work with that investigator full-time and attend weekly cancer biology seminars. Some of this summer’s participants, including Matthew Wu, had never worked in a lab before. Wu, a senior at Thomas S. Wootton High School in Rockville, Md., worked with Mi-Hye Lee, PhD, assistant professor of molecular oncology and Stephen Byers, PhD, a professor and molecular oncologist and the director of shared resources for Georgetown University Medical Center. Wu considers his experience doing research at Georgetown Lombardi an invaluable one. After doing genotyping and gel electrophoresis at the beginning of the summer, he later worked with animal models, an experience he said he wouldn’t have had elsewhere. This summer, Byers allowed students to look at the outcome of damage to the tumor suppressor gene RARRES1. “One of the big benefits of having young people here is that you can actually see and create an interest in what we’re doing that they’re going to remember for the rest of their lives,” Byers said. In some labs, students work directly with the principal investigator, while in others, students are managed by postdoctoral trainees, graduate students and research assistants, giving early career scientists an opportunity to become better teachers and mentors, Jung said. 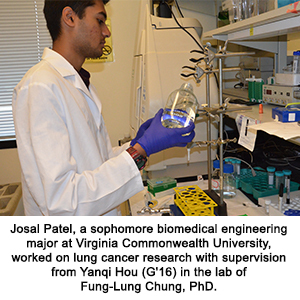 Yanqi Hou (G’16), a research assistant in the lab of Fung-Lung Chung, PhD, spent the summer working with college students Serena Vilasi (C’20), a biology of global health major, and Josal Patel, a sophomore biomedical engineering major at Virginia Commonwealth University, on launching a clinical trial in lung cancer. During her time in the lab over the summer, Vilasi has performed DNA isolation hydrolysis on mouse liver tissue samples, a skill Hou wanted her to develop before she moved on to human tissue. 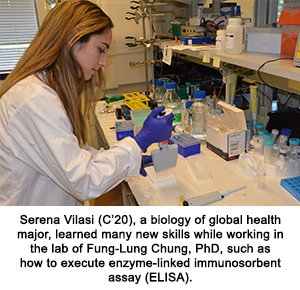 Hou also taught Vilasi how to execute enzyme-linked immunosorbent assay (ELISA), a method the lab uses to quantify the amount of DNA adduct in liver tissue samples. The summer students in the lab of Amrita Cheema, PhD, learned how to prepare samples for mass spectrometry and work with metabolomics data. Cheema, a professor of oncology, tries her best to allow students to work on what interests them most to keep them engaged and motivated, whether they are more interested in computational work or conducting experiments. One of the best feelings for her is when past students email her about their current activities. Many summer program alumni from her lab have done “exceedingly well” and gone on to attend Ivy League institutions, Cheema said. Maarisha Upadhyay, now a freshman at the University of Maryland who hopes to become a surgeon, participated in the Summer Research Volunteer Program for two summers while she was a student at Walter Johnson High School. She believes the research she did at Georgetown Lombardi in high school helped solidify her decision to go into medicine. As a summer research volunteer, she worked in Cheema’s lab helping investigators with two research papers for the 2020 NASA mission, which will involve sending six astronauts to Mars. The study looked at the effects of low doses of radiation that will be experienced by the astronauts in outer space. Upadhyay’s primary responsibilities included tasks like metabolome data analysis, managing chemical inventories and assisting with daily experiments. “It was such an enriching experience. I took AP Chemistry in my sophomore year after doing the Summer Research Volunteer Program and it was really amazing how so many concepts helped me in the classroom, especially in the lab portion of the class,” Upadhyay said.